I grew up playing Atari 2600 when I was younger. I was excited when I visited the Just Play booth at TTPM in September and saw these retro games again. Atari has brought back some of their classic games in mini form. 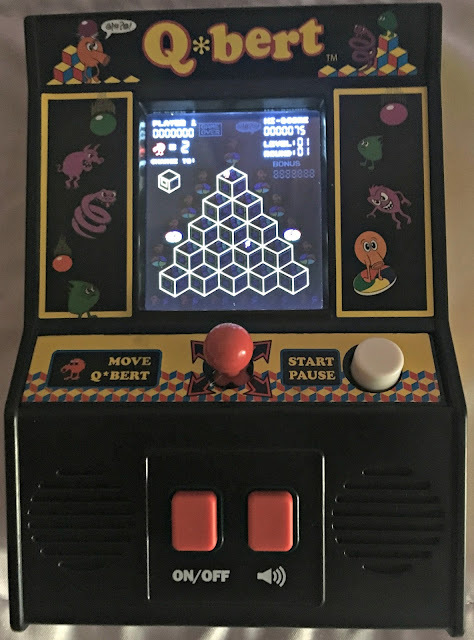 You can now play with Frogger, Q-Bert, and Centipede. All these classic game you can introduce to your children. Challenge is to get the frog to the cross to the other side safely without getting run over. The objective is to change the color of every cube in a pyramid by making the on-screen character hop on top of the cube while avoiding obstacles and enemies. 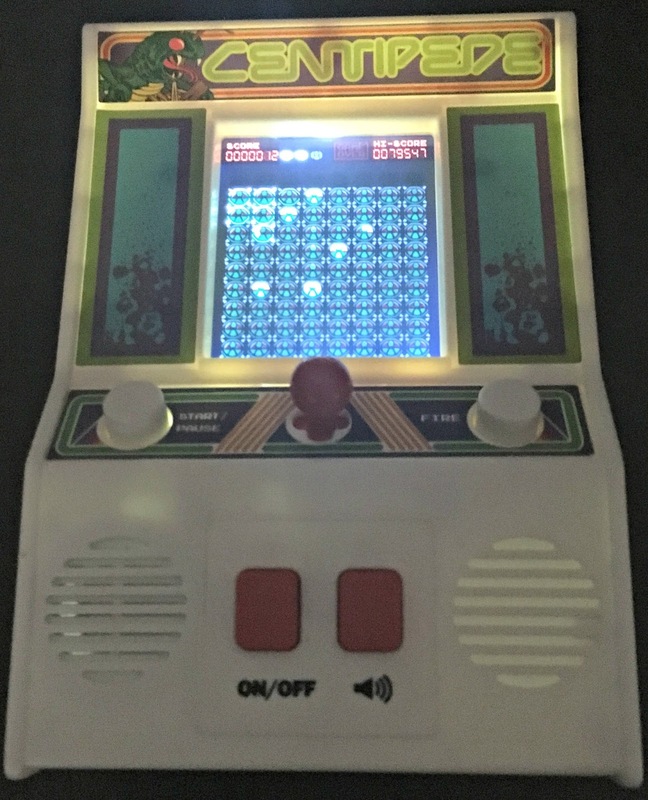 Players use a joystick to control the character. Move your spaceship with the joystick and hit the fire button to shoot down the Centipedes before they and spiders/scorpions crash into you. My son and daughter took turns playing with Frogger while on our trip to Kalahari in the Poconos. This is the perfect travel game for long drives, waiting on lines, and more. Win it!!! 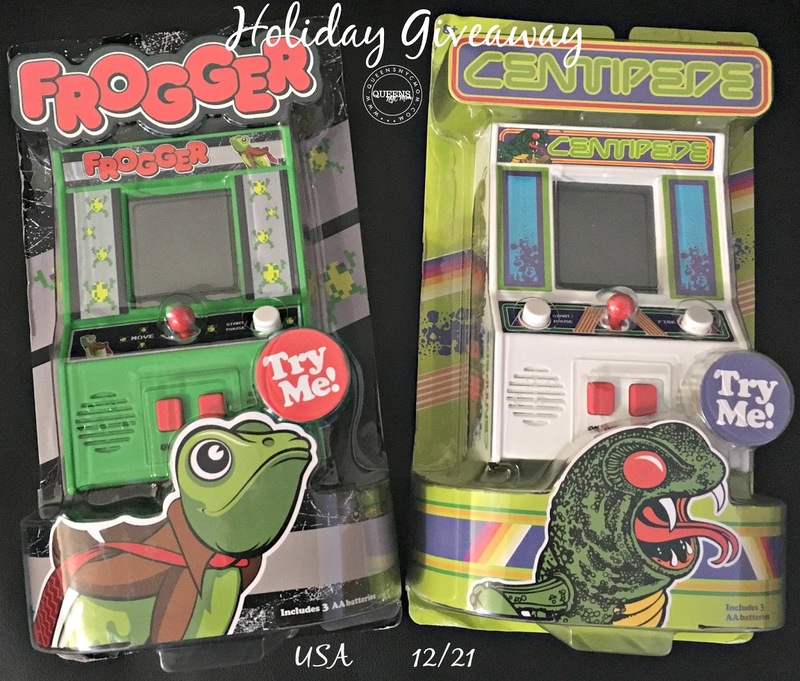 One of my readers will win a Frogger and Centipede mini arcade games. Rules: Giveaway begins on 12/06/17 at 12:00 am EST and ends on 12/21/17 at 11:59 pm EST. You can enter this giveaway using Gleam. One winner will be chosen, and that person has 48 hours to respond to my email. If you do not respond within 48 hours a new winner will be chosen. Must be 18 years of age or older and USA only to enter and all entries will be verified. For comments, you must leave a name not unknown or anonymous for verification. The prize will be shipped directly from the sponsor. 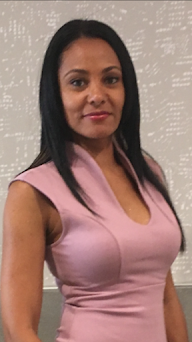 Queens NYC Mom is not responsible for lost or stolen prizes or replacement of prize. This promotion is in no way sponsored, endorsed, or administered by, or associated with Facebook, Twitter, Pinterest, Instagram, LinkedIn, G+ or Blogger or any other social media. I'm hoping to find Weezer concert tickets under the tree for me! My daughthers first choice this Christmas is a hoverboard.She has been asking for one since last Christmas. I would like some books. I know my son wants a fingerling and some movies. A dvd player..or some books. I'm hoping I get Walker's Shortbread and Godiva Chocolates. I'd love a SNES Classic (nerd mom, here.) My daughters are agitating for Fingerlings and LOL Dolls. I would love to get a laptop computer. I would like a new wireless bluetooth speaker. my daughter wants a phone for Christmas. we aren't sure if we are ready for her to have one yet. I just want gift cards this year. I would like some warm winter pajamas. My kid wants a new bike. I would like to get a Keurig coffee machine for Christmas. My son is begging for a cell phone. My daughter wanted a Minecraft Lego set. 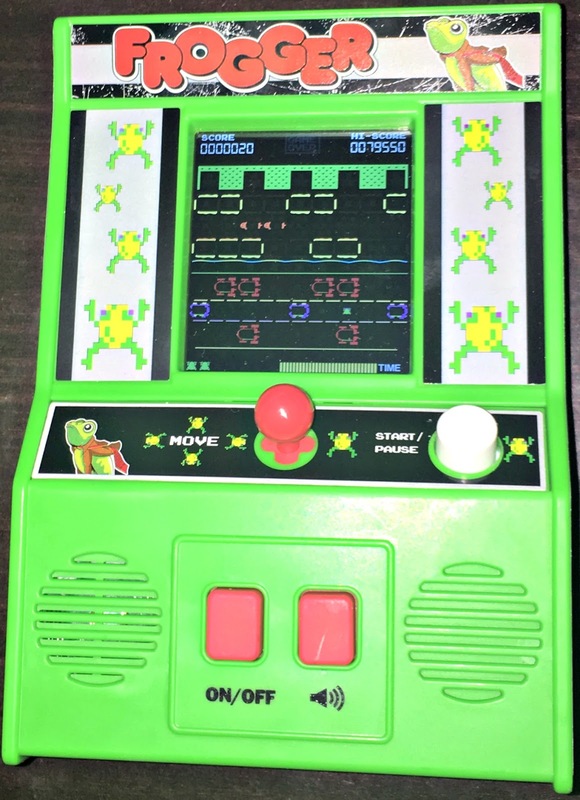 That Frogger game would do just fine for me. my son wants legos, my daughters want cooking play sets and I just want all bills paid in full! Thanks for the chance. I would love to have some new pajamas and maybe a new robe this year. I would love a new couch! I would love to have the Lego Disney Castle. We'd like a family pass to our favorite zoo. I would love to visit my family in Virginia this Christmas! I would love a Laptop. New laptop for one of the kids heading to her first year in college. My sons want nice silver chains and cologne! I would like Lion King on Blu-ray. My niece and nephew have informed me they have never seen it, so I'd like to get for when they come to visit. Thank you for the chance to win! My boys are asking for Nerf guns. ID like to have my house under contract! Hoping for season passes to Universal Studios! Would love a Nintendo Switch! They would love a trip to Disney. My kids want their own phones and a trip to Disney World for Christmas. We need new clothes and/or shoes. I would like an pressure cooker. I would like gift cards! I would just like my life to slow down. We have been taking care of 2 elderly parents, kids and grandkids. It is very hectic. I'd like to get an electric blanket. My daughter wants the Our Generation Veterinarian Set. I'd like an Apple Watch. 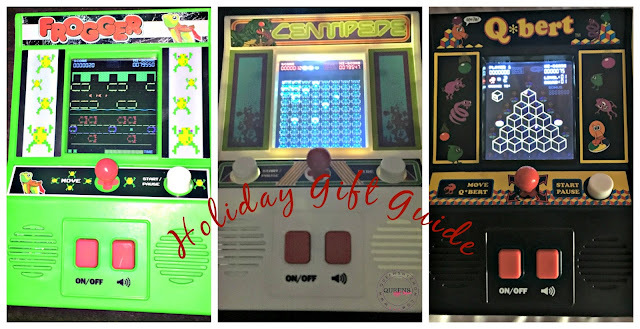 I once dated a girl who had a full-sized Centipede arcade game in her home, and that's the kind of legacy I'd like my kids to have. I am hoping for a new coffee pot, some pots and pans, and some good winter clothes. I really want a wireless phone charger; I read those are better for the phone's battery. What I would MOST like would be for someone else to either clean my house for me or repair my player piano. No, I don't expect either, but it's what I would most like! I'd like some kitchen supplies & my kids want a game console! New clothes because I have lost 75 lbs and everything is too big! I would like new shoes. My kids want the classics--- barbies and legos. I would like a new coat. My boys just want lots of toys. I'd like to be gifted a vacation. candles for me, and for my daughter-Pokemon stuff. I could use some new flannel sheets. I would love a new computer. My kids want the new Xbox. Our daughter is getting a handbag, wallet, and pajamas. My kids want new video games. Thanks for sharing these cool games, I hadn't seen these before. My daughters are asking for clothes and gift cards. I would love a new crockpot this year! 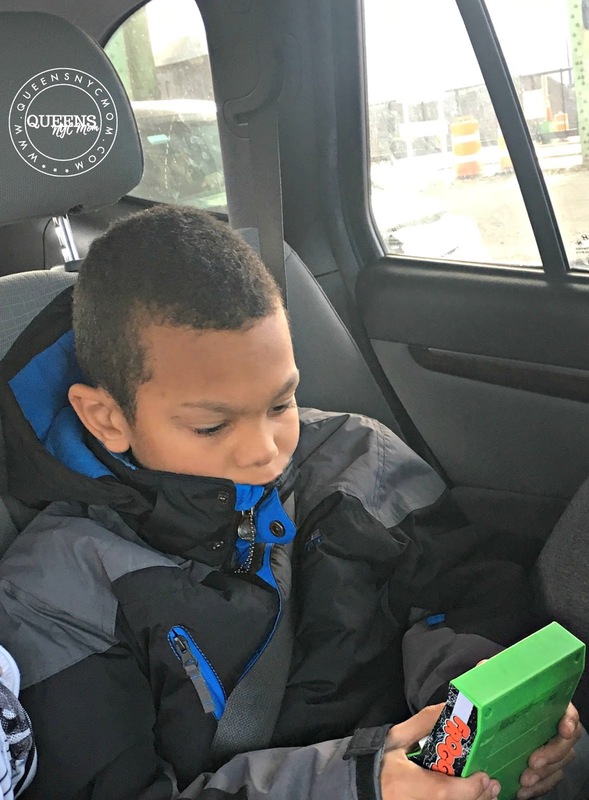 My grandson wants games for his Nintendo Switch(and he will be happy when he opens up 1 of his gifts from us)!!!!!! Would like a new fitbit for christmas. I want some warm socks. Video games and chocolate sounds like a perfect any day! Thanks so much. I would love to have these video games for Christmas. My daughter is really interested in being a chef when she grows up, a pastry chef, and she loves animals, and has some Calico Critters, so I want to get her the baker's shop. IF I cannot find it, she will be getting a Girl Scout's Easy bake oven. Boys are hoping for a PS4. My son wanted the Thomas super station and got it. Any vintage video game to show the kids how we rolled. I would love to see a new tablet under my tree this year. Everyone want a Nintendo Switch in our house. These are so neat and would be so fun for my grandsons to play!! Id like to get a pet containment system for my puppy. Thanks for hosting! I would love a new laptop since mine is almost 7 years old. I would like to receive a dulcimer this Xmas. We need a new laptop for Christmas . I would love to get my son some awesome new Star Wars legos!! Thanks for having this giveaway and Merry Xmas!! The gift I am hoping for is my oldest son flying back home for the holidays. i would like some new pots and pans for christmas! My daughter wants a eukelele for Christmas! My kids want a new gaming console! I would love a laptop computer. My Kids want laptops for Christmas this year! My daughter wants a Pokemon game. I want REI Gift Cards. My grandson wants an Imaginext Batbot. I would love to have a nice pair of earrings. My kids would love video games. My teen son wants DVDs and I'd like a Keurig. Thanks. I would like to have my aunt give me a surprise visit as I haven't seen her in a few years. The Centipede mini arcade game would be awesome to win. I'd like a new graphics card, mine needs an upgrade. My kids want video games and legos this Christmas. Thanks for hosting! My daughter just wanted money to go to the mall. Myself don't usually want anything but if i was to say something it would be anything chocolate or some salt water taffy. My so would love anything to do with video games.. I like to get cozy socks and warm pajamas. My kids like gift cards or items on their Amazon wish list now that they are older. My four year old son wants a red bike with no training wheels-pray for him! I want a Kia Sorrento. My child would like to receive the Nintendo Switch. My daughter would love a puppy. I would love a Nintendo Switch for my kids. I'd love a new washing machine! My daughter would like an American Girl doll. my son wants a punching bag...?? My daughter is asking for an iphone 6, vans shoes, and a skateboard. I would like a Amazon gift card to buy all sorts of books.now my nephew would like a game for his tablet . My son wants games for his Nintendo Switch for Christmas! I would love a new meditation pillow. My girls would love anything Harry Potter. My daughter asked for a large rug for her room and a new desk. I wanted some books and Red Bull. I really would like the new Stephen King book, Sleeping Beauties. My son wants wrestling figures and Legos. My daughter keep asking for LOL dolls!